Welcome to Victoria Hopkins Interiors! If you’re a fan of vibrant, fun and eclectic interiors then you are in the right place! We offer a range of interior design services as well as a collection of vibrant and unique soft furnishings. Get in touch now to discuss your project! Interiors and design have been a lifelong passion for me and have been making things for as long as I can remember and I can’t tell you how many times I convinced my parents to let me decorate my room as a kid! 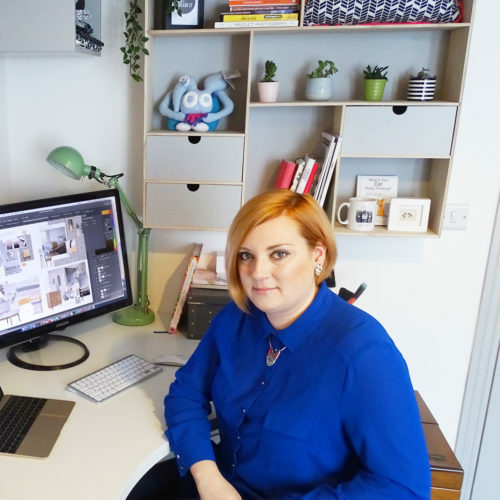 After studying product design at university in Edinburgh, I moved to London and worked in digital design before heading back up north where I worked in digital marketing for a number of years. It wasn’t until we purchased our first property in 2016 when my passion for interiors was reignited. Finally I had the opportunity to flex my interior design muscles and I started taking on small jobs for friends and family and selling products I had initially made for myself online in my Etsy store. In 2017 I set up Victoria Hopkins Interiors and knew this was something I wanted to pursue on a more permanent basis. In October 2017 I took the plunge and left my day job to enter the world of entrepreneurship full time and I’ve not looked back since! I love being able to translate my clients ideas and needs into something tangible that they can appreciate on a daily basis. Having a home that you love, and can’t wait to get home and spend time in can enhance your life, and your mood. I want to provide that for my clients. Often you don’t realise how much having an interior design that works for you and your family can impact your wellbeing, but it absolutely does. It’s not just about making things pretty, but also about making the space work for each individual and I love that! The designs and products I create are bold and vibrant and always mix colours and patterns. I want to help my clients express their personality through their home, I want to create interiors that are a true reflection of the owner and work perfectly for them. I also want to provide a slightly different approach to interior design, that’s less traditional (forget the hundreds of books of expensive fabric samples) and more accessible to the everyday home owner. So if you think that sounds up your street, then get in touch for a free consultation today!